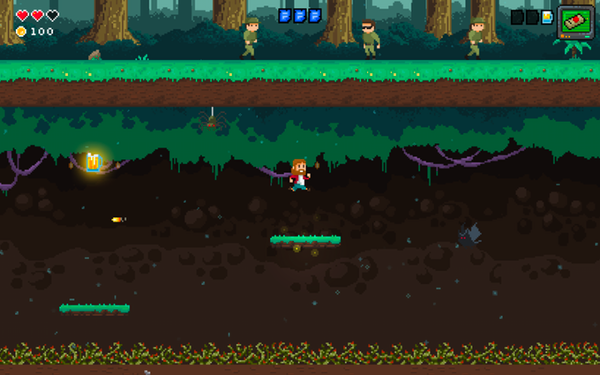 With a Kickstarter campaign in full swing, Rome-based Fantastico Studio offers Landflix Odyssey, a parody platformer following Larry as he navigates pixel levels inspired by TV series; clock ticking, I chatted with Daniele Bianchini (Co-founder and CEO at Fantastico, not to mention a huge fan of old-school pixel art and The Secret of Monkey Island) on the team’s strategies and goals moving ahead. Erik Meyer: Finding himself navigating worlds based on popular streaming service shows (and gaining powers that correspond with those worlds), Larry becomes the everyman (including a signature ‘burp’ move), so as you draw from popular media and create your universe, have you found you need to be careful of? How do you avoid being too close to a show like Stranger Things while still making the experience recognizable to fans of the series? Similarly, how can Larry remain an everyman/slob while still being a compelling protagonist? Daniele Bianchini: As anyone could expect, we walk on a tight rope when we’re talking about copyrights. We’ve debated quite a lot on how to avoid infringement, while still keeping each show’s own feel. The game, being a parody, runs around that. In the same way, we twisted the series titles. 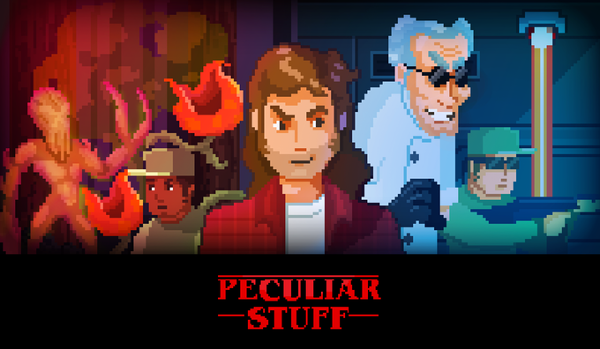 “Peculiar stuff”, for example, has a similar meaning to “Stranger Things”. It’s a kind of play on words, so we kept each show’s feel while creating our parodistic version of its plot. 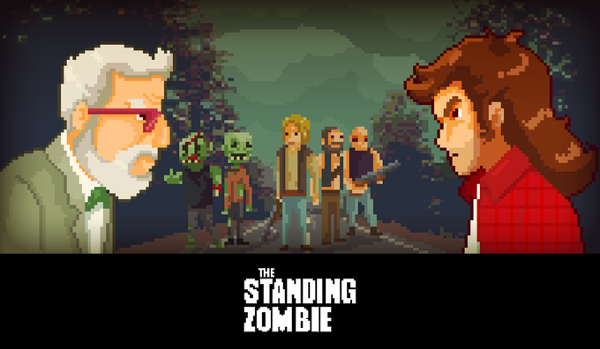 Also the pixel art was chosen not only because it fits our tastes, but to estrange the game even more from the original shows, avoiding copyright infringement. As for Larry, he can be the main character precisely because he is the everyman. He’s not traveling through Landflix to save the world (even though doing so ends up saving it), but to get back home and to his lazy life. He’s driven by his desire to live a normal life, but he’s also a have-a-go-hero. We wanted him to be appealing to the average guy, not to be an actual hero. EM: In the late ’80s, Captain N: The Game Master ran on Saturday morning cartoons, creating a similar premise, in that the main character gets sucked into his TV and finds himself in game worlds. From a concept perspective, Landflix Odyssey goes a few layers deep (we play a game inside shows inside a streaming service), going down the rabbit hole, to reference Alice’s Adventures in Wonderland. What is it that audiences find so compelling about characters from the ‘real’ world being pulled into lands of imagination? Do you see it as escapism, or are we searching for larger truths reflected in media? DB: Everyone dreams of living adventures at some point in their lives. Having a “real” character pulled into a fictional world makes the viewer (or player in this case) empathize more with the main character, quenching his/her thirst for adventure. So we wouldn’t actually call it escapism; from our point of view, it’s more similar to the kind of drive that pushes explorers to see the world. In the modern age, with the world being known and just one-click away, it takes the form of ending up in a different place, where everything is new. EM: Often, a single character can go a long way toward explaining otherwise outlandish concepts, and I see Doc and the nuclear batteries furthering the plot as such. A mad scientist can be a reason for wild inventions or unusual phenomena, but as developers, how much do you worry about something being ‘believable’ as opposed to simply presenting an explanation and running with it? DB: As you said, Uncle Doc is a really important character, even more than it seems. He was the one who trapped the evil guy (Landflix’s CEO) in the dimension that later became Landflix, and he is the one indirectly responsible for bringing Larry into Landflix. We also have plans to make a side episode on Uncle Doc’s and the CEO’s past if possible. As far as making things “believable”, we’ll try to explain everything when possible, but at the same time will take a cue from Rick and Morty. In the episode in which Rick gets turned into Pickle Rick, there is no explanation as to how he did it. 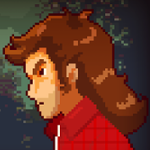 EM: I’m a fan of pixel art, so as you’ve incorporated worlds with fairly different visual styles, how do you balance the need to have the overall game have a consistent look while retaining the unique feel of the shows you’re goofing on? DB: Having only one pixel artist working on graphics surely helps. Up to now, we didn’t have many problems, because she kept her style unique while giving a different feel to the ambience. So I think we’re managing greatly on this note. EM: Studio Fantastico hails from Rome, Italy, so I’m interested in Italian game culture and the effects it has on your work. Do you see the local gamer environment and institutions of higher learning pushing development, or do devs usually come from already-established companies with a desire to stretch their creative limits? DB: Sadly, there aren’t many gaming companies in Italy, and in a similar way, there aren’t many institutions teaching game development. A lot of gamers in Italy dream of becoming developers but end up giving up because of this obstacle. The few that are able to enter this world are usually self-taught (which is the case with our team members). EM: Run and gun platformers have evolved since the ’80s and have a dedicated following, and games like Cuphead have pushed the genre forward, so from your point of view, what are must-do elements for a run and gun title? What things do you feel have been overdone, and what do you see as uncharted territory? DB: We think one of the highest peeks in the run-and-gun genre has been “Metal Slug”. Certainly an important feature of these kinds of games would be control precision. Also, they need a lot of personality (both Metal Slug and Cuphead have tons of personality). Indeed, the most popular run-and-guns are usually the most challenging ones. They have to be accessible at the beginning yet have a steep increase in difficulty as you progress through the game. As for some uncharted territory, I can’t think of a decent 3D run-and-gun game which would be cool to have. EM: Increasingly, indie studios release demos as a way to get feedback and give previews of upcoming games. To my experience, feedback can be a bit scattershot, so what kinds of helpful responses have you gotten, and to what extent have these responses steered your work? DB: We’ve received lots of feedback since the demo released. Certainly, the most useful responses are the gameplay videos sent directly from the early players. We realized that a lot of players didn’t have the same approach to certain situations as the game developers, so this helped make things clearer to us and easier for the players. 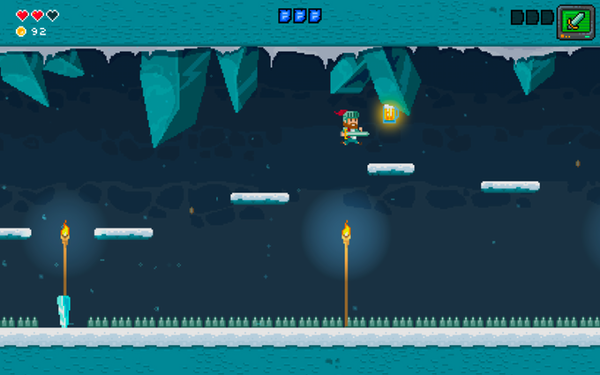 We’ve received a lot of tips on level design, too, which helped considerably. Recently, a Youtuber, “Coalfire”, made a really useful review of the game. After having played the first level, he spent a few minutes talking about the critical points in level design. This was a huge help to us, not only in improving those levels but also with regard to creating better ones in the future. EM: Bad guys in 8-bit games are often cartoony by nature, so I’m interested in The CEO and his lackeys. What makes a bad guy we can love to hate, old-school style? DB: As the game is a parody, we wanted it to have a fun feeling overall and to create a contrast between the main character and the bad guy, Landflix’s evil CEO. The contrast is also with his minion, the MK2, which has a cartoonish look, while we wanted the CEO to have a serious and evil feel. Also, making him serious helped us to differentiate him from Uncle Doc: the first one being a serious bad guy, while the second becomes a goofy good one.